CHPV have been photographing and filming impressive feats of engineering and industry on land, sea and air, for over 50 years. Their work has taken them all over the world, from the harsh waters of the North Sea to the hot sands of Dubai. Charles Hodge Photography and Video Production, now trading as CHPV Media, specialises in shooting offshore projects. Originally oil and gas installations, the bulk of work nowadays involves renewable energy projects. CHPV was founded in the 1960s in Suffolk by Charles Hodge. Charles was not only an accomplished photographer but also a keen aviator; his flying skills allowed him to obtain dramatic shots offshore, giving the company a niche position in the North Sea's emerging gas industry. Alan O’Neill joined CHPV and took over the company in 1984. He continued to expand the business and added film production to its services. Since the first stirrings of activity on the North Sea, CHPV has been going to extremes in pursuit of great photos. "We've been hanging out of helicopters for over five decades." State-of-the-art, high-definition, equipment and software keep the company at the cutting edge of imaging, editing and graphics capabilities. "We were introducing a new helicopter type and didn't know where to start with the flight safety briefing video, with no reference in the region. CHPV managed the whole exercise, providing the script for approval then mobilising at short notice to Dubai for the filming. This optimised cost/time and they delivered a high quality product, on schedule. Perfect!" "CHPV, in particular Alan O'Neill and his team, have recorded the progress of the Sheringham Shoal project since the first onshore works began. They have always provided exactly the type of stills and video required and have been particularly flexible when we have faced waiting on weather or other issues which meant delays or alterations to shooting schedules. The work has been outstanding, and the images provided represent some of the best I have seen within the UK offshore wind industry." Everyone in the CHPV team has to have the patience of a saint, the carrying strength of a mule, the negotiating skills of a diplomat and the head for heights of a mountain goat. We are used to working around the fast pace offshore. Things don't stop for us to get our shots! "WOW! I think it is brilliant. It is so good and over and above what I was expecting." "I have no hesitation recommending the services of Alan O'Neill of CHPV. Alan provided professional, innovative and creative support to a number of challenging risk management projects in which DNV was involved. These included the development of an Integrity Management - Sharing The Experience DVD which was based on an offshore pig launcher incident, and capturing the sound and visuals during an experimental programme investigating large scale CO2 releases to assist in carbon capture and storage (CCS) implementation." At CHPV we understand the safety issues of working offshore. We have all the necessary insurance and survival certification for safely working in this challenging environment. CHPV recently won an East of England Energy Group Innovation Award for their film work. 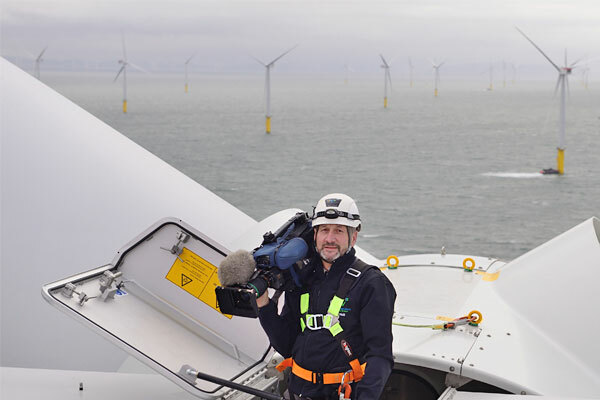 The award recognised their development of innovative techniques and technology to capture images and video from previously inaccessible sites, resulting in striking close-up views of offshore installation work. Remote control and live video feed greatly improves safety, keeps the cost to the client down and produces more exciting, in-depth movies than ever before. CHPV is constantly diversifying and investing in new and exciting technology that extends the boundaries of offshore video and photography, enhancing our unrivaled reputation in the field.